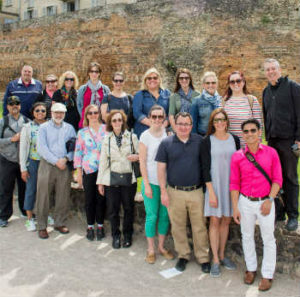 Last week I was fortunate enough to participate in the Holy Cross Heritage Pilgrimage in France with eighteen Notre Dame colleagues from the Division of Student Affairs. The three main requisites for making a pilgrimage are the belief that God responds to prayer, the conviction that grace is present in a special way at holy sites, and the desire to make a sacred journey. I was hopeful on all three fronts! I believed that God would respond to my personal prayers and that of those I was carrying with me to France; I believed that there was grace to be found in the places where Blessed Basil Moreau and Father Edward Sorin lived and prayed; and I was making a sacred journey to help create a sacred journey – the Notre Dame Trail. I was asked a year ago to lead the execution of the Notre Dame Trail, the signature event of the University’s 175th anniversary celebration. The Trail has three main objectives: 1) to honor the Congregation of Holy Cross, 2) to educate about the 175-year history, and 3) to create a unique pilgrimage for Our Lady. We hope to create a journey of the soul through this pilgrimage, and I was confident that a better understanding of the Congregation’s beginnings would aid us with this challenge. I knew it was Father Basil Moreau who had founded the Congregation of Holy Cross and that it was he who sent Father Edward Sorin to establish a school in Indiana in 1841, but I wanted to know more about these great men of faith. The Holy Cross Heritage Pilgrimage, led by the Rector of the Shrine of Blessed Basil Moreau, Father John De Riso, would provide such an opportunity. Basil Anthony Moreau was the 9th of 14 children brought into the world in 1799 by Louis and Louise Moreau. 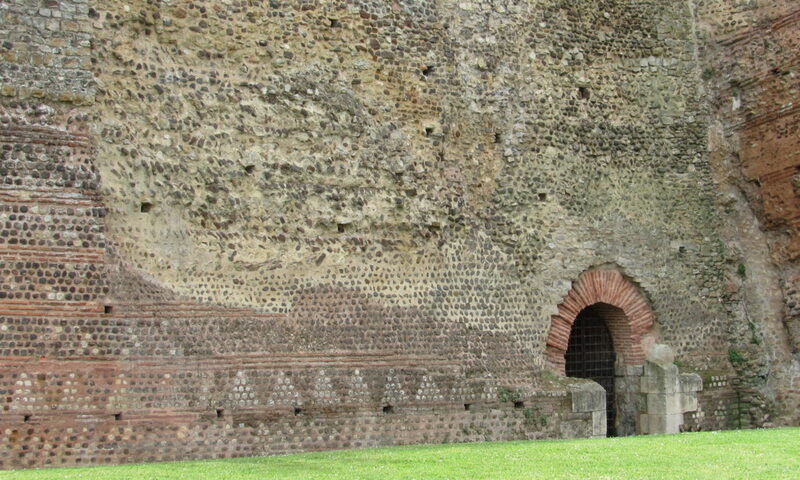 On the pilgrimage, we saw the wine cellar where he would have slept as a small boy. His childhood home was in the shadow of the local church in Laigne-en-Belin which was rebuilt and consecrated in 1867, a ceremony at which Moreau attended. This quaint town and original church are where Moreau would have first received the call of discipleship. He was ordained a priest in the Chapel of the Visitation within the diocese of Le Mans on August 12, 1821, at the age of 22, and served as a seminary professor of philosophy, dogma, and Sacred Scripture. We pilgrims said a prayer in the Chapel of the Visitation for all those who have dedicated their lives to God through the Congregation of Holy Cross. Moreau had a strong devotion to Mary and sought to establish a community modeled after the Holy family – a community of three societies – including priests, brothers and sisters. When we visited the Shrine of Blessed Basil Moreau, this was quite evident. The Shrine includes a bas-relief of the Sacred Heart of Jesus and of the Holy Family of Nazareth, a statue of Our Lady of Sorrows and stained glass windows depicting the seven sorrows of Mary, a statue of St. Joseph, and a naïve dedicated to Saint André Bessette. During the celebration of the Eucharist at the Shrine, we had the opportunity to voice the names of the priests, brothers and sisters who have had an impact on our lives – Joe, Kevin, Joy, Austin, Larry, Veronique, Nate, John, etc. Later, we visited the Solitude of the Savior, which was the first novitiate of the priests of Holy Cross. Here we saw the altar on which Moreau celebrated Mass as well as the tiny room in which he would have stayed. This tranquil spot is where he went to pray and reflect, and is said to be the place where he revised and edited the Constitutions of the Congregation of Holy Cross. In his later years, Moreau was taken care of by the Marianites of Holy Cross here. A handful of retired Sisters still live at the Soltitude and were proud to give us a tour. Moreau was originally laid to rest in Holy Cross Cemetery in Le Mans in 1873; his remains were brought to the crypt of Notre Dame de Sainte Croix in 1938. Now known as the Shrine of Blessed Basil Moreau, his tomb was moved to the south transept of the church in 2007 in connection with his beatification. Although the Sisters of the Holy Cross, those who founded Saint Mary’s College, separated from the Marianites of Holy Cross in 1869, these were the sisters of their origin. I was proud of the dedication, trust and respect these sisters demonstrated towards Moreau, especially in his later years. Blessed Basil Moreau, the founder of the Congregation of Holy Cross, was declared “Venerable” by Pope John Paul II in 2003, and was beatified in 2007 by order of Pope Benedict XVI. Those of us now affiliated with the priests, brothers and sisters of Holy Cross, are charged with demonstrating the same kind of zeal to help advance our shared mission. I secured three little stones from the Holy Cross Cemetery in Le Mans, one representing the sisters, brothers and priests. I intend to carry these stones in their honor along the 316 miles of the Notre Dame Trail this August, and will deposit them at the Log Chapel. We will give each pilgrim a stone to carry during their journey; these stones will symbolize each pilgrim’s individual prayer, wish or intention. I will be praying that the Notre Dame Trail touches the hearts and souls of thousands of pilgrims. Alleluia! Father Moreau’s whole goal in life was to be more Christlike. For me, what do I need to do every day to emulate that better? I want to wake up each morning with that goal in mind and focus on what it means for me and all of those I encounter. The faith of Father Sorin and the 6 brothers who traveled to a new land, with a new language, and started a school from nothing. I need to hold strong to that faith as I make decisions on a daily basis, knowing that I am where I am supposed to be in my personal life as well as being the fruit of Father Sorin’s efforts and continuing his dream. The craftsmen that built these amazing French churches 1000’s of year ago put blood, sweat and most certainly many lives lost into creating these homages to Christ. How can I ensure I am honoring Him every day, pushing beyond my limits? The sculptors that toiled over every minute detail of the statues and carvings in the churches. So much thought went into every look, body placement, symbolism and meaning in all the carvings. I probably understood 1/100 of everything they wanted to be preserved for history. What can I do to make sure I am being mindful of every detail in my life? Recognizing people’s needs, the subtleties of of their emotions, taking time to truly think through every decision I make and not overlooking details that are important. The artisans that created the intricate stain glass windows wanting to tell a story. Painstakingly choosing all the right pictures, colors, and symbolism for getting their points across in their storytelling. Are my actions telling Christ’s story through the windows into myself? The faithful that endured war after war and the French Revolution and yet were determined to rebuild and not be swayed in their commitment. I am typically a very positive person, but making sure that I don’t wallow in setbacks and they don’t derail me to continually move forward. Check back with me next year to see how I am doing, but know that I am making this commitment to myself and my fellow pilgrims! I have said it many times over: our experiences are very individualized, but they are better when shared. In sharing, we become personal which leads to vulnerability. With vulnerability comes trust. Thus, I have always try to uphold trust in every relationship. All of this leads me to an evening at Chartres during our pilgrimage. We gathered in the parish center-like room southeast of the cathedral for the opportunity to process the pilgrimage for the very first time as a group. Many blog posts were shared or derived from that heartfelt “upper room” liberation, similar to this one. Everyone was a little vulnerable that evening, which enabled the deep connection we formed with one another. Someone asked Fr. John how he became a priest, particularly a Holy Cross priest. He openly provided a heartfelt and sincere response. It was a vulnerable moment for him, yet he trusted us and shared his deep personal response to a loving invitation to a relationship with God. Similarly, every relationship is an invitation and a response he reminded us. This is called discernment. I experienced similar calling to the priesthood but right now, my vocation is the Rector of Duncan Hall as a lay minister. As the rector of Duncan Hall I am finding God, fulfillment and satisfaction in knowing that I helped empower many people for the betterment of Duncan Hall, Our Lady’s University, the Church and the world. My ministerial experiences formed my opinion that an effective minister has to be able to empower other people to the ministry. I believe we should care more about celebrating Christ with others and leading people to powerful experiences with Christ rather than monetary or congratulatory rewards. Jesus focused his service on the betterment of others through significant actions with humility, acting as a model for all shepherds. I have had the privilege of witnessing the Holy Cross priests in their selfless service to their ministry at Notre Dame. It has been empowering to me as I share in their ministry. I believe that this Christ-centered life is something critical to ministerial work, to being an effective minister. When people get too focused on the material, they lose focus of the more important virtues of a life of selfless servitude and have a difficult time fulfilling the rigorous demands of the ministry. Sharing life with our students takes a lot of work! Developing deep meaningful relationships with proper boundaries requires a lot of maturity, wisdom and guidance. WORK! Authentic relationships need work and harder work to maintain them. All of this hard work points to one thing: relationship with God. It’s hard work but I am finding it in my ministry as the Rector of Duncan Hall. It’s only been three days since we left Le Mans, yet I am already feeling nostalgic. The Holy Cross Heritage Pilgrimage is one of those mountaintop experiences that I will look back often with awe. To hold on to this joy, to this happiness, to this peace is a gut-level instinct we all have. We hold on even stronger when we don’t think that other experiences can top them, or we don’t trust that they can ever happen again. In a spiritual sense, as good as it is to hold on to something wonderful, a love that is freely given, an experience of life that gives us new meaning to our lives, we ultimately have to let them go. We eventually have to go down the mountain. We have to let go of our experiences so that something new can be realized. We are blessed with moments on the mountain; we are blessed with new insights about our lives; we are blessed constantly with the joy and happiness we share with each other. That should give us a sense that if this is good, there has got to be something more. This pilgrimage validates all my other mountaintop experiences: there is always something more. My experiences are all interconnected and woven together to write the story of my live. These experiences tell my story, give me endurance for the journey, and strengthen my faith in God and in others. Heading into this pilgrimage, I had already begun to reflect on what roles we, as humans, play in each other’s lives. However, my focus in these reflections was primarily on the relationships and connections I shared with family and close friends. After spending 6 days exploring the path of Father Moreau, it has become abundantly clear to me that the connections in my life extend much further than my own backyard. It just takes a little time, effort, and maybe a step out of your comfort zone to uncover them. The villagers we met during our journey live over 4,000 miles away from our home at Notre Dame, yet they welcomed us as friends, sharing stories of their families, the town, and the church. Our encounters may have been fleeting but the connections were meaningful all the same. On a deeper level, the bonds formed with my fellow pilgrims are ones I hope to keep for a lifetime. The physical journey made us fast friends, but the spiritual education and shared dedication to Notre Dame solidified the group as a family. These people, who I’ve shared a campus with for years, changed from strangers to friends after a leap from my comfort zone. Well worth the risk! Finally, Fr. John provided us with incomparable spiritual, cultural and logistical guidance throughout the trip. Our experience with him can serve as an example of the support and connection available to us from the Holy Cross family on campus. While I have learned many things on this pilgrimage, I feel one of my greatest lessons has been to nurture even the smallest connections with those around me, as even the most fleeting connections can have a powerful impact. Many of my fellow pilgrims have already reflected on the special bond and connection we have felt with one another on this trip; nonetheless, I want to share my experience as well. Our last evening fellowship in Paris was a fitting end. We hiked Montmartre for the last holy site visit and then dinner at La Bonne Franquette where we sang many Happy Birthdays to fellow pilgrim Heather Grocke-Saunders, signed the ND flag for Fr. John, and toasted one last time. As we journeyed down the mountain, I decided to be adventurous and slide down a set of steep decline rather than taking the steps: “You want to see something cool?” It was “cool” for about a second until I lost control, wiped out, and hit my face against the rocky concrete. While I got right up from the fall, pride and scar tissues remained on those rocks. The concerns that everyone expressed for my reckless abandon save all embarrassment and physical pain. Of all the groups that I have been a part of, this group exhibits the most nurturing fidelity I have ever had to privilege to be a part of. It did not come as a surprise because as I got to hear each individual pilgrim’s stories and connect with each one individually, I recognized that we are a nurturing bunch. It worked out for me because I was the beneficiary of this nourishment on this particular night. As I sit on the plane reflecting about the trip, I realize that this experience provided far more than I ever anticipated. Each day we learned about Father Moreau’s journey and the places that were of great significance. We visited many churches and learned about how each played a role in his life. We walked some of the same paths he would’ve walked and saw where he slept when he needed some time of solitude. We met so many wonderful French people who welcomed us into their spaces and showed us such wonderful hospitality. The places we visited were things I expected. I expected to learn more about the life of Moreau and how deeply faithful and committed he was. I expected to be moved by the history of our university and seeing where it all began. What I didn’t expect is how deeply moved I would be by all of these experiences. While I walked through the labyrinth at the cathedral in Chartres, I thought about how that labyrinth is much like our life. It twists and turns and you never know where it’s going to lead or who you will come across along the way, but it sets you up with experiences that, for better or worse, shape you. Even when we feel our path is veering away from our goals/hopes/dreams, we come to recognize that with faith it will bring us back on the right path. This is the moment I realized how beautiful and deeply moving this experience was. I couldn’t believe that I was sitting in places, looking at structures, and following paths of people who had been there over a thousand years before me. I also realized that, beyond learning the history, I was developing these deeply meaningful connections with the other pilgrims. When we began our journey I knew a handful of the group and the others I only met for our three Moreau prep meetings. These meetings were filled with so much information I wasn’t able to really connect with everyone. On the plane ride to Paris, I was assigned a seat next to two other pilgrims (one of whom I knew and the other I didn’t). I sporadically chatted with the girl I knew, Rochelle, before she fell asleep. Mamie and I, another pilgrim, didn’t say more than a couple sentences to each other. Fast forward to 7 days later and I consider Mamie my friend and am truly excited to reconnect when we get back on campus. I found a connection with each person and will return to campus knowing that this time together helped us forge friendships that will last forever. I have 18 new friends on campus and several abroad who all shared in this incredible experience. I really didn’t count on how much these people would enhance this pilgrimage, but they all provided their own unique ” je ne sais quoi” that made this trip so much more positive, moving, and truly more beautiful than I ever thought possible. I may be saying “au revoir” to France, but with the memories that were made I know that France and Father Moreau’s story will have forever changed my heart. We have shared meals and conversations, wine and laughter. We have adventured together to new places, where awe and wonderment can only begin to describe how we feel about the many pilgrimage sites we have seen. Many new friendships have been formed, both with my fellow pilgrims and with those individuals that have shared pieces of our journey with us. We will continue to share memories with one another from a once in a lifetime pilgrimage that will last forever. I am ever so grateful for the many blessings this journey has given all of us. I feel that this pilgrimage has provided us with a refreshed and renewed spirit of MIND and HEART to continue the work that was started so many years ago by Father Moreau, Father Sorin, and the many others of Holy Cross that had a hand in shaping the path and vision for Notre Dame du Lac. This journey has offered us moments of the ZEAL of Father Sorin, to fuel our desire, to share our talents, and to help one another along our path in life. Together as pilgrims, we have added new members to our FAMILY from around the world by rejoicing in each other and our faith community, and it has provided me with a newfound HOPE in God’s promise of the Kingdom. With love and many blessings to all of you! After I walked through the Basilica of the Sacred Heart and prayed to the Sacred Heart of Jesus to offer all of the worries and prayers that are on my heart. We once again were seated for dinner together. The food and drink were incredible. The fellowship and warmth of our flock of pilgrims was resounding throughout the land. Many more rounds of Happy birthday were sung to me throughout dessert, I was truly moved to laughter and tears. As we left the restaurant and happily walked the streets and square of Montmartre, many more spontaneous songs of happy birthday were sung by my pilgrim friends rejoicing in our hearts for life and love for one another. In the square many people joined in song, both visitors and waiters from restaurants. That is when another truly amazing moment happened, a family from Costa Rica approached our group. One of the women in the family exclaimed it is my mother’s birthday too! She is 67 and I am 37. Her name is Natalie. Which is one of my grandmother’s names. The connection I felt was unlike anything I have experienced before. We held hands, hugged each other and cried a little as my friends and her family rejoiced in this birthday celebration. It is one of the many moments this week when I truly felt that my heart was open, my worries had melted away and realized with a clear heart and mind that I am able to be present and open to those wonderfully joyful moments with all that were present. We ended the evening in Montmartre with a view of the full moon over Paris and a partial view of the Eiffel Tower sparkling one last time, before heading back down all of those winding stairs. I want to thank all of my fellow pilgrims, and Father John for making my birthday, as well as, this entire adventure amazing. Each one of you will forever be in my heart and my prayers. Our evening in Montmartre was unforgettable. We hopped off the Metro and headed up the circular concrete staircase leading out of the metro station. What a climb that was, the never ending tower of stairs leading up to the city, and then more steps up to the summit and the Basilica of the Sacred Heart. Upon arriving at the summit, the view of Paris was breathtaking. We arrived at the Basilica of the Sacred Heart. The beauty of this Basilica is overwhelming. So many pilgrims from all over the world journeying here to offer their heart to the Sacred Heart of Jesus. Many times on this journey we have listened to Father John, Father Frank, and Father Ralph speak about Father Moreau’s devotion to the Sacred Heart of Jesus. This is so important to the work that we do with our students, we must look at the model that Jesus provides for us and imitate him to our fullest. In life, we must search within our own hearts and give our hearts to The Lord. Breathe, let go, trust and give your heart to the Lord. Let your worries not weigh you down. Trust in the Lord. The previous passage is from a prayer that was shared with us in our guide on this pilgrimage. This prayer has really helped me reflect on the day to day tasks and worries that I have in my heart. This has helped me to see that bringing all of my worries to the Sacred Heart of Jesus will allow room in my heart for all the joy and blessings that life and the kingdom of God has to offer. One of Fr John’s sermon mentioned a story of his spiritual formation and his director talking about “thanks-living,” really living gratefully for the gifts of others. Everything this week makes this point. I am overwhelmed by the welcome we received from our French hosts, the guidance , patience, and good humor of our leaders, and the friendship and thoughtfulness of the pilgrims. What a blessing to have had this opportunity for reflection and fellowship. I hope to look for the gifts of others around me when I return to work tomorrow. I pray that I say and “live” thanks throughout the everyday pilgrimage waiting for me back home. The Holy Cross Heritage Pilgrimage, for me, has been transcending. It has not only brought the “New World” closer to its heritage but also connected the past to the present; thus, transcending time and space. During our first Mass of the pilgrimage, Fr. John DeRiso CSC greeted the pilgrims, “Welcome Home! You’ve done well.” At that instant, I had a vivid imagine of Fr. Moreau French-embracing Fr. Sorin with those words. While it was not Fr. Moreau, it was another CSC; and it was not Fr. Sorin who returned home, it was us! There we were, 175 years after the founding of the University of Notre Dame (Notre Dame Trail! Shameless plug. ), 19 pilgrims journeyed home. To be welcomed home with such proud embrace was an enlightening moment for me. It sparked a deep connection and a sense of purpose in my collaborative work with the Congregation of Holy Cross and its coworkers. It rekindled the spirit within that burns for the zeal of spreading of the Kingdom of God—the very purpose of Fr. Moreau’s ministry. It gave deep meaning and purpose to my ministry as a Rector. I am a co-worker in this ministry and mission with the many Holy Cross priests that came before and many who will follow. It was real! An “ah ha” moment if you will. In the work of caring for our students, it can be frustrating and powerless at times because we don’t know if all the late nights and early mornings will bear any fruits. Sometime it can even feel insignificant. As I am writing this, the awareness of self-knowledge and my understanding of God’s providence and the mystery of salvation are being revealed. This grace is humbling. Self-centeredness can creeps up on us in this ministry—“no one is dealing what I have to deal with!” Thus, we can get discouraged, feeling self-centered, to see our insignificance in our work, to think of what we can or cannot do, and forget about God and God’s will and providence. One thing is certain, God never forgets! God knows our significance, our dignity and our worth. But God also expects us to accept, as from God’s hands, the daily situations God sends us and to act as Jesus would have acted and the grace to it. Perhaps, Fr. Moreau and Fr. Sorin felt these turmoils 175 years ago when they were establishing the University of Notre Dame mission. Perhaps not. But I am confident that we share the same frustrations, helpless, and powerlessness in this work collaborative work. But taking step back, I wonder if Fr. Moreau could have ever imaged this great harvest that is the University of Notre Dame. The seeds that was planted, namely by sending Fr. Sorin to this Northern Indiana Mission, are being watered and hold future promises—the hope of the Cross. Our work is not yet completed and hopefully, our spirit is enlivened by this pilgrimage and home coming to continue this work as co-workers in God’s vineyard, working to catch a glimpse of heaven on earth at the University of Notre Dame. Heaven—our ultimate home, the destination of every pilgrim—God! Growing up, my grandmother has always been a pillar of faith for my family and I. When I was younger I never quite understood the wisdom she was imparting on me, not just as a human, but an individual who declared Jesus Christ as her Lord and Savior. One piece of advice my grandmother continually repeated to myself and my cousins was “True success is measured by your ability to make the right decisions”. As a child, I smiled politely and nodded. I heard the words of my grandmother but had not completely internalized them. Throughout this pilgrimage, there was example after example of servants who served the Lord who made the right decisions. In all of their decisions, they had the Lord as their focal point and knew they could accomplish amazing things through Him. As we stepped in multiple churches over this past week, I continued to be in awe of the work and detail they were able to create. These buildings were not built with grandiose technology, but with servants who knew their work would be glorified and appreciated because they made the right decisions. Over time their decisions would be tested with fires, wars, and revolutions. The servants continued to make the decision to rebuild to honor their Lord and create beautiful spaces to praise his name. Pilgrimages were never talked about in church when I was growing up. Therefore, I was unaware of the churches being seen as pilgrimage locations until I started to learn more prior and during this journey. This experience has opened my eyes up to Christian pilgrimage and the destinations Christians can visit to deepen their relationship with God. I see this pilgrimage as a right decision in my life that will allow me true success in explaining the rich heritage of the Holy Cross order and the foundation blocks of Notre Dame to students, visitors, colleagues, and the worldwide Notre Dame family. As of right now I don’t know exactly how my successes will bloom into something beautiful to admire at Notre Dame, but I am embracing that process. I will look back on this process and be mesmerized at the blessings in my life that have come by making the right decision to journey on the pilgrimage. To this day, my grandmother stills imparts wisdom to me, but today I am honored it came full circle with the words my grandmother has repeated all along. It not only helped me make a stronger connection to the University, but also reminded me to continue to make right decisions to deepen my faith and be open and aware of the blessings and successes that are on the horizon. Over the last week I have enjoyed the many hours I have spent with my fellow pilgrims. Many of us have taken pictures at each location we have traveled. At times we looked more like tourists than pilgrims. Within our parishes, we hear about sharing our “talents and treasure.” This pilgrimage provided a real-life reminder of how we are all provided a gift from God — talent. Coming on this pilgrimage, I thought I had a pretty decent talent related to photography. Over the last few days I have learned that Rebecca, Mark, and Nhat have much more talent than me when it comes to photography. I found myself asking advice from these three pilgrims about angles, lighting, and camera settings so I could refine my talents and take better pictures. In just a few short days, I have learned a few new skills that I look forward to expanding in the future. The fruits of our labor will be shared on our photo gallery once we return to campus and have a faster WIFI connection to upload the hundreds of pictures we have taken. More importantly, as I return to campus, I will commit to find specific ways to better share my talents with others to help them grow and serve others. Thank you to all my fellow pilgrims for making this an amazing journey. This week has blessed me with with a deeper understanding of what it means to be a shepherd with our students, it has also blessed me with prayer, thanks giving, and humor. Father John is amazing, and we were blessed to have Father Ralph and Father Frank assist with our teaching. My heart has grown stronger in faith, and the names of Father Moreau and Father Sorin have taken on new life for me and what it means to work at Notre Dame. My one wish is that I would have really thought more deeply about the petitions to bring with me. I don’t really think that I fully understood the power of prayer that I would feel on this trip. 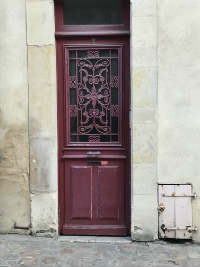 As we have been wandering through the city of Le Mans, I have been enamored with the doors to the shops and homes, imagining what is beyond the other side. Many are painted in vibrant colors with impeccable word work and detailed frames, knockers and handles. 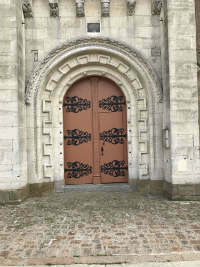 The ancient doors of Le Mans are a reminder to us to open the doors of our hearts to receive the Holy Spirit. We began this journey eager for a renewed enthusiasm in our faith. 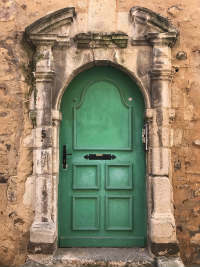 As we venture to Chartes, Paris and eventually home, may we always remember the doors of Le Mans and be inspired to never to close ourselves off from Christ and one another. Riding in the bus from Le Mans to Chartres I drifted off to lsleep, and right before I woke up, I had an image pop into my head. There has bee a lot mentioned during this pilgrimage about “community.” Yesterday we left the hotel at the same time some younger (kindergarten) children were being lead by their teachers to cross the street. I struck me how similar we looked to the children. Here we are, Fr. John’s flock, and he is our shepherd. Others have already known him, but I did not. Advice provided by Mimi Beck (2016 pilgrim) was to “trust Father John.” This piece of advice kept coming to mind. I’m not sure yet how much this experience has strengthened my relationship with Catholicism, but it has strengthened my faith in people. I am not an adventurous type of person when it comes to food. While many of my fellow pilgrims were excited at the opportunity to enjoy French cuisine, I was not. Fortunately, I have found solace in my daily baguette (or two). For less than a Euro, I had peace of mind that I would be physically nourished. Comfort helps us get through difficult times. In the crypt at the Shrine in Le Mans, we learned of a story of Father Moreau requesting a candle be lit for him in Le Mans during his journey across the Atlantic for his visit to the missions in America. During my pilgrimage to France, my baguette was my candle — it got me through a few challenging food experiences (as a few of my new friends have realized!). As Holy Cross priests hold the motto AVE CRUX SPES UNICA (Hail the Cross, our only hope) as sacred and a guiding influence, I have found myself praying at dinner how the baguette was my only hope. When I return to Notre Dame du Lac in less than 24 hours, I will be faced with a number of challenging situations. While I will no longer need a baguette, I have a deeper appreciation for the Holy Cross pillar of “hope” and how important prayer can be… even for something as simple as bread. I guess that time truly does fly when you’re having fun…as we depart for Paris and the end of our adventure all I can say is WOW! Spirits are flying high and it seems like we just got here. There are sooooo many moments that we have shared that range from being spiritual and reflective to just plain laughing with each other about flaming desserts, creaky floors in our rooms to how delicious and abundant the baguettes! Our travels yesterday accomplished many of my personal goals. I have gained a better understanding of who Fr. Moreau and Fr. Sorin were and how/why they were called to come to Indiana. Fathers John, Ralph, Frank and Tiphaine have been outstanding teachers! Meeting the Pilgrims who came to Notre Dame this spring was also great! They were so kind, hospitable and grateful to see and connect us. Again, hard to believe that we have been here for almost a week and it is already Friday and we have only two days left. I am excited to see what lies ahead and so grateful and honored to be a part of this pilgrimage with some old and now some new Notre Dame friends. These last 4 days have offered me something I have not experienced for quite a while — uninterrupted time to reflect. No email. No phone. No text messages. My day-to-day work is very rewarding, but some days are quite challenging. Seemingly never-ending thoughts of administrative tasks and the These last 4 days have found me packing up my phone in the morning and putting it in my backpack, not to be touched until the day has come to a close. Getting “unplugged” has provided me a chance to continually reflect on how thankful I am — my journey to how I have gotten to where I am today; where I am today; and where I hope to be in the future. As an undergraduate student at Bradley University, I would never have imagined working at the University of Notre Dame. I would not be where I am today if it were not for the support of others. Most of my time has been giving thanks for those who have sacrificed on my behalf, primarily: my parents, my wife, my kids, and the my mentors at Notre Dame who have provided me countless opportunities to serve our students in different ways. During this pilgrimage, I have learned about how “opportunity” can be so powerful. Fr. Moreau was provided an opportunity by his local priest to enter the seminary; Fr. Sorin was provided an opportunity by Fr. Moreau to start a mission in America; and I too, have been provided many opportunities by Holy Cross Priests. A few days ago at the Shrine of Blessed Basil Moreau in Le Mans, my fellow pilgrims were asked to pray for Holy Cross priests who have made an impact on us. A number of “C.S.C.’s” have made my last 19 years memorable and fulfilling, and hearing the names of the 30+ priests and brothers brought back many memories over the last 19 years. I will be eternally grateful for the opportunities that two Holy Cross priests, in particular, provided me in their respective roles as Vice President for Student Affairs: Fr. Mark Poorman and Fr. Tom Doyle. On Tuesday morning we began our day finishing up our tour of the Shrine of Blessed Basil Moreau before we said Mass as community around Fr. Moreau’s tomb. I found myself reflecting upon how Moreau had a deep devotional prayer life and a sense of direction in his ministry. My prayer and reflection then led me to further ponder my own sense of purpose as a Christian and in my ministry as Rector of Cavanaugh Hall. This question lingered in my mind throughout the afternoon as we visited Fr. Sorin’s hometown. Fr. Sorin was a visionary and just like Fr. Moreau, he had a deep devotional prayer life. Both Fr. Moreau and Fr. Sorin achieved so much in their lifetimes. As we gathered to pray around the baptismal font where Fr. Sorin was baptized, I continued to pray and reflect on this desire I have for a stronger sense of direction, a vision, and fearlessness to do the Lord’s work. 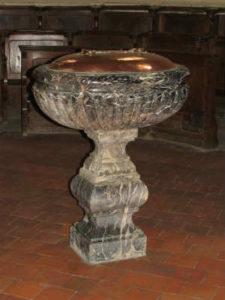 As I was praying and looking at the baptismal font, I was reminded that because of my baptism I am called to holiness, to trust in Christ’s wisdom and surrender my heart to Christ’s love. 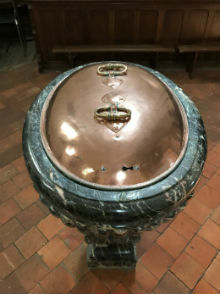 My eyes were drawn to the small keyhole on the copper cover and in that moment I realized that the key to our success in developing a deeper sense of direction and fulfillment in our ministry is to return to our baptismal promises. We must take the time to stop and listen to God in order to develop a routine of prayer where we converse with God and hear his calling. Fr Moreau valued solitude and introspection. This was the foundation upon which both Fr. Moreau and Fr. Sorin oriented their ministry. Through prayer they heard the voice of God and developed their visions for the Congregation of Holy across and the University of Notre Dame, both to become powerful sources of goodness in this world. I look forward to visiting more grace filled places along this journey so that I may hear God’s voice and the ways he is calling me to serve. As I write, it after midnight which means it is Nichole’s 30th birthday (it is also my 42nd birthday, but that is not the point of my story)! We have discussed it at various points this week, and it has been a point of reflection for me as we have traveled on our journey. The last time I came to France, it was a month or so after my 30th birthday. I was here for work like I am currently, but as I compare and contrast those trips, I cannot believe the differences (along with a few similarities). The last time I was in France it was a whirlwind of appointments and meetings, I never once stepped into a church, a chapel, or a cathedral and I barely took a moment to consider what I was seeing (except for the fabrics I selected at the fabric show). While this trip has been no less busy and I am equally exhausted, it has been incredible to have our focus be to take in our surroundings and consider them in the context of our work, our personal lives, and our faith. It has been a wonderful balance of history, reflection, and community. Throughout our time in LeMans, Ahuillé, and Laigné-en-Belin, we have heard the story of Fr. Moreau saying yes to the request to send Fr. Sorin and the Brothers to Indiana, and I am amazed by the sacrifices that had to be made to make the trip possible. I don’t know that I fully understood the magnitude of such a request. It required incredible faith and vision, and it speaks to how important education was to Moreau. As I reflect on the time of my previous trip to now, I am struck by their sacrifices and by what it means to love what you do. While I enjoyed my career during my last trip to France, I would not say that I was particularly fulfilled by my work. I cannot articulate how grateful I am that Fr. Moreau, Fr. Sorin, and the Brothers were willing to take a risk and believed their mission would succeed. Their faith has provided a new career path for me in work that I truly love. The trip does have similarities, too. Like my last trip to France, I am enjoying excellent meals, but most importantly I am traveling with an amazing group of colleagues (including our hosts. Fr. John De Riso, C.S.C., Rector of the Shrine of Blessed Basil Moreau and Tiphaine Hamerel). Each of my fellow pilgrims has enriched this trip for me. And for that, I am most grateful. So, to my fellow pilgrim, Nichole, Bon Anniversaire! Thank you for providing an additional catalyst for reflection by turning 30! PS-As an FYI, I do not believe I am going to be in trouble for sharing Nichole’s age since she has publicly shared it as well (but on the off-chance I am in trouble, I promise to make it up to her with a birthday pastry or one of Willerton’s baguettes). In my essay application for this pilgrimage, I wrote about the desire to have the opportunity to learn and grow with my colleagues in Student Affairs and the University. Given our busy schedules, we often don’t have time to connect on more than a casual friendly level. Tonight on the eve of my birthday, my hopes became a reality as I sat with new found friends who a few short days ago were struggling to learn each other’s names. We have gotten to know each other SO well. This opportunity for growth spiritually, intellectually, and professionally has been one we all shared and walked in together. We have grown together, learned together, and laughed until we cried together (usually at Willerton’s expense). We haven’t even returned and already we are planning ways we can reconnect once we are all back on campus. It’s been such a great joy to gain so much, mostly friendships, on this journey so far. “How good and pleasant it is for brothers and sisters to dwell in harmony”…as I reflect on the past few days this came to mind. Since the start of our pilgrimage I have felt and viewed nothing but friendship and support from my fellow pilgrims. From folks simply getting to know each other to people buying meals, lending Euros or cell chargers everyone sincerely had been supporting one another. Father John and Tiphaine have been outstanding hosts…but isn’t that what brothers and sister do for each other? The most reflective and spiritual aspect of the trip was when Father John spoke about the font that Fr. Sorin was baptized in. It made me think of conversations that I had with my father and uncle before and after I was baptized as young boy which made me very peaceful, happy and very appreciative for those memories. I am so very grateful for my new friends and this experience and I can’t wait to see what our next adventure will bring. God Bless. Moreau Pilgrimage Day 1: So much thought, reflection, prayer and planning having gone into my preparation for this amazing experience. I wouldn’t have thought my first comments would relate to my language prep! Having had extensive French language training: 2 years in high school, plus Mango lessons these past few weeks, along with Google translate, I thought I was ready. But, my first attempt failed miserably! 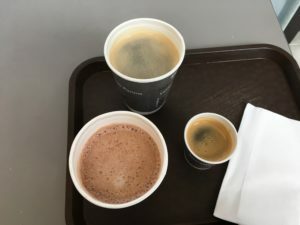 I asked for a “medium decaffeinated coffee with chocolate.” I received the following 3 different hot beverages! Loved them all! Love France! “Time flies” — how appropriate for our pilgrimage! The last 3 days have been a whirlwind of excitement and exhaustion for me, as well as my 18 pelerins (pilgrims). It’s hard (and somewhat sad!) to believe that we will be leaving this beautiful country in just a few short days. As I wake up in Le Mans for the second time and look across the town from room trois-zero-six at the Concordia Hotel, I give thanks to all those who have made this such a fulfilling experience. Just three days ago we gathered outside the Main Building on Notre Dame’s campus to load a bus to the airport… at least that’s what I thought. Sorin Circle was more than just a meeting location. Pilgrims from the 2015 and 2016 journeys joined us to offer us well-wishes, prayers, and last minute advice. Laughter and hugs (and a little bit of jealousy!) permeated our gathering. After a prayer from Fr. Pete McCormick, C.S.C., Director of Campus Ministry (and 2015-16 pilgrim), and remarks from Erin Hoffmann Harding, Vice President for Student Affairs (and 2016 pilgrim), I realized just how special this experience would be. We boarded the buses for the journey to O’Hare, and our fellowship began to form as we asked questions of each other and began to develop deeper relationships. Shortly after arriving at Charles De Gaulle Airport in Paris, we were greeted by Fr. John De Riso, C.S.C., Rector of the Shrine of Blessed Basil Moreau. When I think about the charism of hospitality within the Congregation of Holy Cross, I can think of many C.S.C. priests who have made me feel so welcome at Notre Dame over the last 19 years… and Fr. John is no different. It became apparent as we boarded our bus to Le Mans that we were in for what past pilgrims have described as a true experience in Holy Cross hospitality. I have many memories that I look forward to sharing in the coming days! We all arrived in Paris safely, where we met Lauren and Fr. Ralph; we were grateful. All luggage arrived, even the big orange duffle bag in the oversized cage; we were grateful. Fr. John greeted us and welcomed us to France; we were grateful. All buses so far have been in great working condition with super drivers; we are grateful. I have now learned the names of all my fellow pilgrims and am so grateful that they have adopted me as the bandit pilgrim outside of Student Affairs. All the basics have been covered! Blessings abound! We were able to visit the shrine of Blessed Basil Moreau today. Before we went in, Fr. John shared with us much of the history of these buildings, which truly represent the birth of the Congregation of Holy Cross. The Congregation lost these building for a period of time to the Jesuits and then to the government, and how wonderful that we were able to again secure the church and one of the buildings. We were standing in the courtyard of the building where Blessed Moreau would have chosen to send Fr. Sorin and the 6 Brothers to America. The community would have prayed for them and sent them from this very spot over the Atlantic to New York City, and then by water to Vincennes, Indiana, and eventually to what is the campus of the University of Notre Dame. I have now visited all of Fr. Sorin’s major stops, but in the opposite order. Last summer, I visited the Basilica of St. Francis in Vincennes; last March I visited St. Peter’s Church in NYC where Fr. Sorin said Mass upon his arrival to America; and now I have stood in the Shrine of Blessed Basil Moreau, where it all started. It is extraordinary that we will bring all of these learnings together as part of the 175th anniversary of the University of Notre Dame later this year through the Notre Dame Trail. I am eternally grateful for this experience! Alleluia! One moth from now, 19 Notre Dame pilgrims will travel from South Bend, Indiana for a spiritual journey to holy sites in France, including Sainte-Croix, where Blessed Basile Moreau, C.S.C. founded the Congregation of Holy Cross in 1837. For the last 3 weeks, pilgrims have spent time together to meet each other and prepare ourselves for a spiritual journey. Guest presentations by Professor Cunningham, Professor Clairmont, and Mimi Beck provided a foundation for an understanding of the Catholic Church in the 1800’s, Holy Cross Spirituality, and how to prepare ourselves so that the pilgrimage will be both a personally and professionally moving experience. You are welcome to follow our travels and reflections through this blog.